Sandra Schermerhorn: This is Sandra Schermerhorn. It’s August 11, 2006. 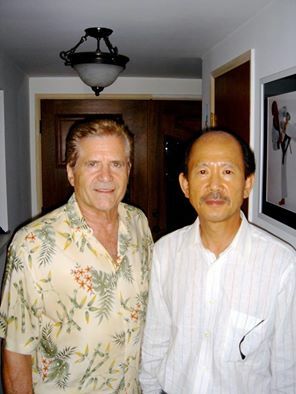 I’m in San Diego, California, USA, talking with Vic Martinov, Sa Bom Nim. Sa Bom Nim, I was wondering if you could tell me where you live now and what your Dan number is. Vic Martinov: I live in Santa Ynez, that’s y-n-e-z, Santa Ynez, California, and my Dan Bon number is 10189. Sandra Schermerhorn: And your current instructor? Vic Martinov: Who my current instructor is? Vic Martinov: My current instructor– that’s interesting. I never thought of that. I would have to say that Kwan Jang Nim is probably my current instructor. Sandra Schermerhorn: Yes. And do you own a studio now? Vic Martinov: No, I have a studio at my home and I am involved in– well in most of my career I’ve been involved in the studios in the Los Angeles area. So, that was sort of what you might call my following, that I was involved in; the people, the students and the instructors, studio owners and the studios in the Los Angeles area, that was my base. Sandra Schermerhorn: I see. And did you have your own studio in the Los Angeles area? 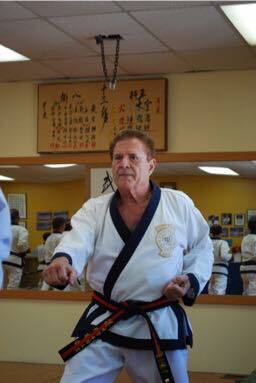 Vic Martinov: …studios, yes; most particularly in the South Bay Moo Duk Kwan. Sandra Schermerhorn: Sir, could you tell me what motivated you to begin training in the martial arts? Vic Martinov: Well I- when I got out of the service, the army, the U.S. Army– and let’s see, that was 1957. So, in 1958 I– well I was looking for some physical fitness mostly and I was very- I felt I was a practical person, and I looked for the best use of my time, which was to say I’d like to not just go to a gym and work out, I’d rather get involved in a fitness program that also developed other areas. Like in martial arts I always felt it was physical fitness, mental training and self-defense, in that order; and the order has never changed, it’s physical fitness, mental conditioning and self-defense. 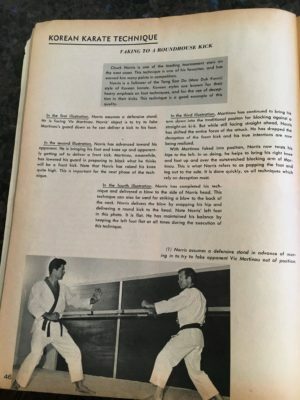 So, that was– so I studied actually Aikido, and I started studying Aikido just about in 1959, 1960. Sandra Schermerhorn: And where did you study that? Vic Martinov: That was in the city of Lavita [ph? ], California. Virgil Crank was my first instructor, and from there, there were other Japanese instructors, from Japan, that came over– Akimata [ph?] and (Sensei Mits) Yamashita [ph?] and some of the other instructors that we had. So, I studied Aikido for several years and then I got interested in– I was always interested in other forms of karate. And so, when Chuck Norris opened up a school in Torrance, his first school, as soon as he opened it up I joined his class, and that was- I think that was about 1962, as I recall. 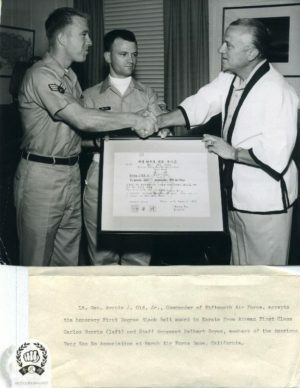 Chuck Norris presenting Moo Duk Kwan certificate from Hwang Kee on behalf of his authorized American Tang Soo Do Association in the USA. 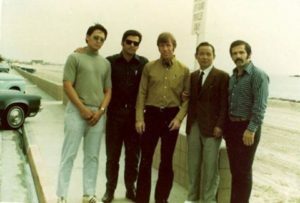 Black belt magazine 1967, showing Victor Martinov as a Red Belt during a photo shoot with Mr. Carlos (Chuck) Norris at the Norris Karate School in Redondo, CA. 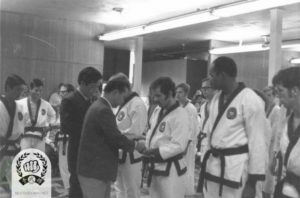 Sandra Schermerhorn: And was that Tang Soo Do? Vic Martinov: That was Tang Soo Do. Sandra Schermerhorn: At that time? Vic Martinov: It was, yes. Sandra Schermerhorn: And how old were you when you started training? Vic Martinov: Let’s see, I was 25 I believe, 25. Sandra Schermerhorn: 25. One thing that I forgot to ask you, just as a little introduction to yourself, that if you don’t mind we could fill in here, if you could tell me just something about your hobbies, your education, your employment history, just a little bit about yourself in those areas. Vic Martinov: Well my employment history is not– I was a real estate developer, syndicator, just–. You know, I went to school– when I got out of the Army I went to night school and it took me 14 years to get a 4-year degree, but all nights. And I studied martial arts. In martial arts I was studying Aikido and Tang Soo Do, and I was going to school nights for those 13, 14 years, and I was studying real estate on the side. So, I was very, very busy. I remember that. Vic Martinov: That’s all I did. But in that path of my schooling was a lot of years of developing a lot of different aspects of business and law and engineering and public law; all these things I wasn’t really sure where I was headed with, except that I was trying to get educated more than a degree. And when I got into developing, building, syndicating, everything I ever studied it seemed like I was using every day. It was amazing. So, that was just a little background of the way my life went. I did all the studying and then I used it, and it was perfect for me. So, dealing with conceiving development projects and acquiring property and raising capital and dealing with engineers and architects and stuff. And I had to work in my father’s construction company for years when I was younger too, so I had a little background in that. And I did work for L.A. County electrical codes for 17 years and I got a lot of public works, construction background. So, I was equipped for the business that I got into which was, as I say, development and syndication and so forth. So, that’s my– from there I developed just a property management capital and to manage my own properties. That’s where I’m kind of at right now. So as far as the martial arts are concerned I started studying aikido and studied the karate and I never stopped, never once; from 1962, Tang Soo Do, I stayed with it and still all I want to do is work out. I’m not interested in the politics and the administration and all the stuff that we all went through, and necessarily had to, in order to try and develop something that was going to endure, and have lasting life beyond any one of ourselves. Sandra Schermerhorn: Before you started training was there any tradition with family of martial arts? Vic Martinov: No not really. My brothers studied a little at the same time. No, I would say there wasn’t. Sandra Schermerhorn: And you’ve always been in California? Vic Martinov: No, I was born in New York. Vic Martinov: Yes. I was, in New York City. I lived on 177 West 83rd Street when I was a little boy, when I was a little guy. So, but at about the age of 7 or so I came to California. So most of my life has been in California. Sandra Schermerhorn: Yes. Oh okay. Your early training, what was training like in the early years? Vic Martinov: training was ah…You see, we didn’t really have the secrets of the art as we thought that they may exist. We really didn’t have a lot of technical guidance but we made up for it by training hard, and we thought that we could overcome anything if you just worked out hard. And so, we worked out hard, and we fought hard. And in those days, you had a Friday night class and they’d call it Destruction Derby, and that was not- that was the people from other arts that had come to train with us. 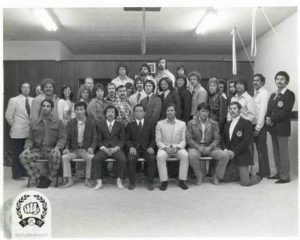 And I can think of one individual in particular, a gentleman by the name of Wayne Lamb, he used to build surfboards in Redondo Beach and he was one of Nishiama’s [ph?] students that had took fighting. But he’d come in on a Friday night class and he gave- coined that phrase, Destruction Derby. We trained hard. And then in those days the tournaments started, started getting into vogue between the different schools. So, they were all open tournaments. You’d go to any school and put on a tournament and get anybody you could get to come. Sandra Schermerhorn: In the tournaments, did they do, forms and sparring, or did they start out to be just sparring? Vic Martinov: Just sparring, started out to be just sparring. There was no distinction with the weight classes or ranks it was a blood bath. Vic Martinov: Yes, and rank, and pretty much the dans would spar with the gups, but they got to spar pretty much. It was a while before they separated green belts from red belts. But you could– and then for grand champion, a red belt, you win a grand champion of the whole tournament, where there was dans and everybody else. So, it was an interesting time and the rules were–. 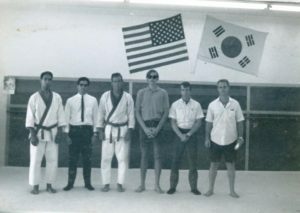 You know What we have, as I see it here, is the- really a frontier of martial arts that is taking place in the United States over the last half a century, and before then it was almost like there was none. And today we have full-blown, very visible styles that have all evolved, not from zero, but from what came to this country, what was imported into the country. But it just is interesting to me to think that here we have 50 years of martial arts, how it grew and how it developed and how its expressions changed in the United States, and that’s taken place by a lot of different organizations that have followed similar paths to try to understand what the arts were about, and to try to establish those arts and to define them and interpret them, and people making livings and things like that. So today, you look at what we have today it’s unbelievable. Sandra Schermerhorn: So back when you started training did people have full-time schools and did they make a living from it? Vic Martinov: Some of them did, yes. Most of them didn’t but some of them did. 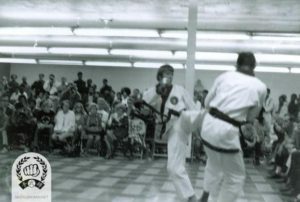 Yes, there were a lot of different styles, and talking about that, that were not Tang Soo or even– that might have been from Okinawan styles, Japanese styles or Chinese. But they all started out small, everything started out small. It was just a matter of opinion. Sandra Schermerhorn: Like when you went to class at Chuck Norris’s school, about how many people would be in your class? Vic Martinov: Well when we started there might have been three or four of us, starting. 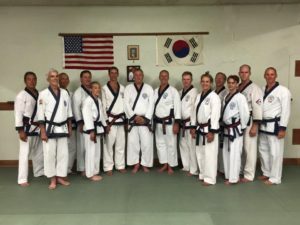 But over the years that I was there– well his particular case is another story because clients and financiers came in and they promoted his schools and started to build his schools into what they considered like state of the art, tech, Tang Soo Do schools. And then they started running it like a Jack LaLane business, selling programs and all this, and they advertised and they had program directors, and it started immediately getting away from the old traditional instructors trying to teach, to business people trying to sell programs. And so, to answer your question how many people? Toward the end of the existence of the chain that was Norris schools, there were large classes and a lot of students, and it was quite big. Some classes could have 30 or 40 students. Sandra Schermerhorn: So it grew at that time. Vic Martinov: But at the beginning it wasn’t like that. Sandra Schermerhorn: And in the beginning, even when it was bigger than 3 or 4 people, a little bit bigger, were there women or children training, on their own? Vic Martinov: Yes, that’s– there were, but they were way in the minority, children. That’s another thing that evolved and over time it was– you know what we thought was that martial arts was all about punching and kicking, that’s what everybody thought. And then fortunately we came onto the founder of our art who really showed us the way, and that was a good thing for us. Sandra Schermerhorn: In the early training years did you train at a studio? Sandra Schermerhorn: It was actually a building studio. Sandra Schermerhorn: Where you trained. Vic Martinov: Well Norris opened up a studio in Torrance. We called it Five Torrance. It was five buildings all came together and this was like a fishbowl right in the middle of this school, and people used to peek through the windows and watch us train, and it was kind of fun, interesting. But that’s where we started. And then– there’s a lot of history here. I mean, I don’t know how to put it all together. But it started out– for me it was an interest in developing myself and I could see that Soo Bahk Do or Tang Soo Do, at that time Aikido, helped me to organize some parts of my life that were otherwise maybe a little bit difficult to get a handle on, and that would be toward the discipline and the internal/external spiritual development that goes on from, just from the training. So, it had a definite value for me. And also, it felt right, it felt good; you know, this isn’t the only way that you can develop those parts of the human being, spiritual, or internal/external, is through this. It could be through a lot of ways that require discipline, and it just depends on what fits to your nature, what feels right for you. And this felt good for me. And so, I enjoyed it a lot. And we trained hard, we fought hard, and that’s what we believed in. Then you know, this history of these schools built up and then it had its societies [ph?] and came apart a little bit. And there’s a lot of history about what happened, in the Los Angeles area in particular, because in the heyday of these schools there was a system, a corporation, that ah…an umbrella corporation. This was a financial group that had a lot of corporations, one of which was the Chuck Norris Karate Studios. And in that area, they were in business to sell programs, to make money and to promote the martial arts; that’s what they did. 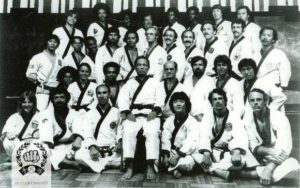 But what I did, along with four other people– and Chuck Norris is one of them– was to form an organization in 1968 that was called The American Karate (Tang Soo Do), in parentheses, Association. And that organization was not for profit. That organization was only for history, tradition, philosophy, certifications and credentials. And so, it was to monitor what was being taught in these other schools, to see that to the best of our ability that we were being true to the founder and his intentions, as we understood them. And so, at that organization I was the president, and Chuck Norris was a member of that, he was the Chairman of the Board of Directors there. There was five of us total, and we were the association and we were the testing board, and that was our job. Somewhere along the line you had a big business going on, in one respect, and you had this little group here that were deciding the certifications. And so, for whatever reason the business felt that they didn’t really like to be constrained by this watchdog organization. And so, it was like this, it would be like somebody would say, “Okay, I’m a member of this, of the board, but I think it would be nice if all the dans were members of the testing board. Let all the dans be members of the testing board, even though I employ most of the dans, because I have this commercial operation going on here, five or six schools, and we pay dans to conduct classes and stuff like this. I have all the dans and over here I’ve got some people that are not part of my teaching staff that are controlling the history, tradition, philosophy”– all those questions having to do with the Moo Do part of it. So, then I do, I start my own organization, and I was pulled out of that. And that’s kind of what happened was the Norris schools moved away from that. And at that time my concept was in the interest of keeping it all together, because I wasn’t looking or tearing anything up– in the interest of keeping things together I felt that a good thing would be that we would build the Norris schools, and the name and everything that goes with it, but in return we would have to keep the credibility, in the way that we saw it. And so, one way to do it would be having your own organization, give out your own certifications, give out your own, but allow the students that go through the process that want to be internationally recognized, that would like to be with the Korean Soo Bahk Do Association, give them an opportunity to get two certifications. See, that was the idea that I put forward, to save this whole thing. I said I’d be willing to continue working– because I did a lot of work, and it was just to give back to the art– and I would continue doing that, and you could have your own organization and do what you want with it, but if you’d like to help we could certify both Korea [ph?]. And so, that was a good thing. But there were other political things going on, and other maybe uneasiness in certain areas where the Norris schools pulled away from the Association. Sandra Schermerhorn: Did it actually occur that people would test under the Norris schools and then come over and get the second certification? Sandra Schermerhorn: They did not, chose not to do that. Vic Martinov: No, it wasn’t that they chose not to do that. That was a proposal that I had advanced as a way to continue on; because actually they wanted the Association to continue on, they just didn’t want to be controlled by the Association. And so, at some point they felt well we don’t even need Korea, we don’t need anybody, we can do our own thing. And I said, well you could do your own thing, because at that time it was growing. I said, well, you could get across the United States, you go on to the stars, but let’s keep– all I cared about was let’s keep the legitimacy of the art pure, as pure as I could understand it. And so, this was just– these are just my thoughts and it’s the true history of what happened in my life. And so, they elected, I’d say Chuck and his advisors I guess, elected to go with their program. See, what happened before that point in time was– well anyway, we had that organization and I took the position with the people who stayed with me, or stayed connected with that organization was that we weren’t leaving the Norris schools, they were leaving our organization. 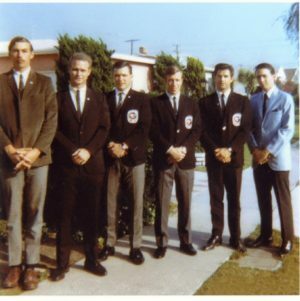 And I have the charter actually still today that’s signed by these five people that formed this American Karate (Tang Soo Do) Association, and I still have that charter, and I have the date and the time and the people’s signatures saying that this is the way we’re going to vote on whether somebody should pass a test or not pass a test or what we believe should be passed on as far as our traditions are concerned and our history. So, it was the real thing. And when he left, he left that real thing, for whatever reason; that was his business. But he was strong and he didn’t really need us. All we had was the art, and our connection with our founder. And so, that went along like that for a while. 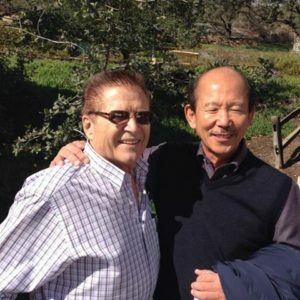 And well actually before the split, before the split took place, the Grandmaster, Hwang Kee, our founder, came to this country with one of the high-ranking Koreans. Sandra Schermerhorn: About when was that sir? Vic Martinov: That would’ve been about 1968; well it was, it was 1968 or ’69, because we had formed this board, we had formed our board. And so Kwan Jang Nim came to California to visit, and with him was a gentleman by the name of Jae Joon Kim, who– there’s a lot of history here and there’s things in between bridging over and missing there was– there was our organization and then Norris went back East and tested for his 4th Dan, and when he came back apparently he represented to the people back there that they were forming another organization; it’s part, I guess, part of not recognizing the organization that we had formed. In other words, it’s like one member, one-fifth of this organization goes somewhere else and starts another organization with other people, and then comes back with his 4th Dan belt, and then– but not telling us. That’s what went on. So, we’re still fat and happy, we’re doing our thing. 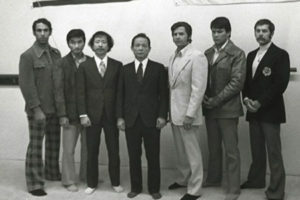 And so here comes the founder of the art, 1970- that was in 1972, with Jae Joon Kim. Jae Joon Kim says okay, well he’s now going to take all the testings. And if you can imagine this, we’re sitting in a restaurant, four people at the table, our founding grandmaster, Jae Joon Kim, myself, one other person– I’m drawing a blank on right now but I will have to remember that, who was interpreting for us. And so, they’re telling me that Jae Joon Kim is going to now receive the testing forms and in other words, the money. And somehow it was connected with this promotion of Norris that whatever deal he made back east or something– it’s a little bit vague right there but–. So, I said– I happened to have with me a resolution that our board passed, and I explained to the founder, we have an organization here– which he knew about because I was writing letters like that– called the American Karate (Tang Soo Do) Association. I said, “We have this and we passed a resolution just last week.” I said, “And I’m going to read it to you.” And I read the points, and the points all had to do with the fact– except one– with the fact that we would always respect our history and tradition; we would always give proper protocol to any high ranking member of our- of the organization; we would follow all the rules to the best of our ability, and so forth, with the exception of one– all testings that we processed are going to go to Korea, to headquarters in Korea, we’re not giving them to anybody else. And that was like a slap to somebody. Jae Joon Kim was not taking that very well. So, after that– and we had taken them around to all the five schools, that were all Norris schools, and they were all flourishing and doing well and students were training hard, and I was proud to take the Kwan Jang Nim to those schools and show him around. And he told me, which was his first, one of his first clues that he gave, as to where he was really going with this thing, when he talked to me after and he seemed really– he really appreciated it, such a fine person– was really appreciative of going around to the schools and seeing the students training, working so hard. And they did, they put on a real good show for him. But it was a little more punching and kicking probably than he was- hoped to see. So, he says, “Americans need to exercise more their minds.” And I said, “Oh?” And so, it gave me something to think about, you know? And so, it, it really gave me something to think about and I took it serious, what he said. And he gave me another little insight to his thinking, I guess you’d say, or his soul. When we took him into a school in Long Beach and I took him into the office, the owner of the school’s office, and I– he had a nice big plush chair there and I asked him to sit, he wouldn’t sit in that chair; he said, “No, that belongs to Master Dolby,” that’s the owner. And he went over and sat on the bench here, you see; and he wasn’t doing that except for one thing, to give a message to us and to tell me this. He coupled this with exercising your minds; and here he’s being considerate of somebody else’s premises and office, and no matter that he’s the founder of the art, that everything it’s built on, and all- everything we’re doing, had to show us there–, Tang Soo do on the wall and certificates that he signed, that came from him on the wall, everything– he’s not going to infringe on somebody else’s rightful place, to respect, you know? Vic Martinov: So anyway he– we were seeing him off, and I had a big package of testing forms that were filled in, with the money and the forms and the applications, everything, with a big address on it, that big, that said Seoul, Korea, Headquarters; it was the address that we had always sent everything to, that I just got through telling him the night before, that’s what we’re going to- that’s our resolution and we’re going to continue doing it. So, I handed it to him, and I didn’t see it but somehow Jae Joon Kim ended up with that envelope I guess. Because the people whose certificates were in there, or applications were in there, recommendations were in there, all got like bogus certificates. They got certificates that looked just exactly like the ones that we had, except you had an A number, for America I guess, after the number, and they weren’t entered into the Dan Bon book. So, these people were not really from the founders’ lineage, at that point, because this person, Jae Joon Kim went to Detroit, started his own situation there and kept the money and cranked out some certificates and was ready to start business as usual. But I saw that that was not right and so I– this went on for several cycles that certificates were going to him; not from me, they were going to him from Norris’s schools. But remember Norris broke off with us. So, there’s no reason for me to question what he was doing, except for one thing. I knew everybody in his organization because I had tested most- almost all of them, myself. So, when he had a testing board and they promoted somebody I could feel confident in my heart that that person met our standards, that were good. I wouldn’t say that he’s not- he hasn’t done the standards, just because he was tested by another board. I didn’t have to be there, I knew those people. So, there was a number of them went through Jae Joon Kim; they would rather work with Jae Joon Kim, who was the organization we had that I continued to send them directly to Korea, Headquarters, Korea. And so what happened was a number of cycles went through, and so I gathered all the people that I could get together, for a meeting, and I said that I realized that a lot of them had certificates that were not registered or they’re not valid as far as the Moo Duk Kwan was concerned, and that I would, for a two-year period, offer qualifying workouts for anybody that would register, and if you registered or set up a workout night, then all you had to do was come and join in a training session, together, and then I’ll process your application and get you a proper number. So, during that two-year period I did a number of qualifying workouts and a number of our guys like Master Moonitz, who’s- got- would never have had his number; but he tested before that, and he was legitimate but he just- his certificate went on for–. And there was a number of people like that. Sandra Schermerhorn: So did these people who got the certificates realize it, or they didn’t realize it until you told them? Vic Martinov: No, they didn’t realize- no they didn’t realize it till we figured it out. And so, then I found out that the founder wasn’t aware of it either. So, this is not something he said, “Well I’m giving you a franchise to go over here and start your own numbering system.” That wasn’t the case. And so anyway that’s what happened, and then we kind of got back on track again. It probably meant that a number of students, a number of members lost time because they lived with the wrong– at the time we perfected their numbers. [ph?] So, they lost some time, but they salvaged their roots and their lineage _________[ph?]. So, after that– oh after that I went to Korea in 1973 and met with Kwan Jang Nim Hwang Kee– it was really a nice trip, it was really a nice trip– and the founder of the art, Kwan Jang Nim Hwang Kee met me at the airport in his beautiful suit, and it was spectacular. He was there and he asked me– well we had a lot of time together and we had a lot of time too, at dinners and he took us–. First off I told him that I was there for three reasons, primary reasons. Number one was to be with him; number two was for training; and then number three was cultural and that. But I wasn’t fledgling, I really wanted to train, I wanted–. Because before that time it was like we had the Soo Bahk Do Dae Kahm book that was written all in Korean. And so, we had that and we used to do our hyungs, and everybody would be arguing about the right way to do it, and then we’d be digging into the book and we’d look at the illustrations to say this is- no. And so, I felt well I want to go to where the secret is, I want to go to the origin of this whole thing and find out the truth and then I’ll have it settled once and for all. And so, a friend of mine, a dear, dear friend of mine, Victor Guerero [ph? ], who’s a student of mine and was a training partner for many, many, many years, many years. And it was hard, we believed in training hard. And he was a guy that would drive you ruthlessly. He’s one of these guys, you get a training partner, and he invents different things to do and he always wants to push you a little farther and stand on your knees and jump on your back to get the flexion moving. And he was a great guy. So, he went with me to Korea. He was so good, as a matter of fact, that the Koreans we dealt with, kicking- training, they called him Thunder Foot. They couldn’t hold a target for him, he was- in this particular sequence that we were doing, it was like spinning around, hooking, heel kick, and they couldn’t get past a round kick. Well he did the round kick on the target. You couldn’t hold him. It wasn’t just them, nobody could. Sandra Schermerhorn: Was he a big guy? Vic Martinov: Yes, he was a big guy. Sandra Schermerhorn: Who used himself very efficiently? Vic Martinov: He was a big guy but he used himself very efficiently too. I mean, he was big and flexible, with heavy legs, and he just knew how to do it, with that guy. And we had a great time. And Kwan Jang Nim had set up two training sessions a day for us for just- at the Army Base there, Yongsan. And that was for forms. And then in the headquarters we had a training session in the afternoon, in Seoul. And so, we had a good time training there. But anyway, we were in the headquarters in Seoul. It was a hard, terrazzo marble floor, and they’re putting us through all the forms, and we got low. And so, Victor Guerro and I are in some stance, in the middle of one of the forms, and all of a sudden, we hear all this talking going on. And actually, it happened to be Yong Ki Hong. Sandra Schermerhorn: Oh yes, I know. Vic Martinov: Yong Ki Hong was heading up the school, and so- at that time. So anyway, it was a great trip. But anyway, so he was arguing with somebody in the back there and we turned around and he had the book, the same book open, the Korean version, looking at the pictures, pointing at them and trying to figure out what we were doing, what was right. So, it occurred to me that that was one mystery. It was the same in the U.S. as it was in Korea, what we were going through in trying to learn. And the truth of the matter was that what you needed to learn wasn’t in that book. The truth of the matter was that it had to do with something other than those– we like pictures. It had to do with the balance, direction, and deliberateness and proper balance and stuff. So, like I say it was pretty interesting. But anyway, we had our trip and we were there in ’73. 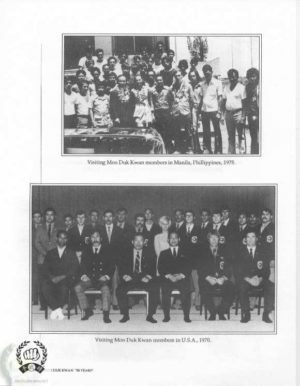 And one of the critical questions that Kwan Jang Nim Hwang Kee asked was how he could organize Tang Soo Do in the United States? And I said, “In my opinion there’s only one way, and that’s for you to come to the United States, period; I don’t see another way.” Because I’d had all those experiences, the experiences that led me up to saying- the resolution that we had in our organization to say that we will process our testing only through headquarters, because we had so many representatives– not really representatives but claiming to be representatives of headquarters– that they are the technical advisors of the Western states, and different names that they put on it, and kind of taking us for a ride here. And so, we finally said, “It will go to nobody, except headquarters.” And that’s kind of where we were, you know? So, I figured that the only way he could really do it was to be there personally. And so, he came, and the rest is the history that you know. In 1974 in Burlington and in ’75 at the Charter Convention, and down the road with that. And so, I was there in ’74, at the Burlington meeting, and it was the beginning. It was good. Sandra Schermerhorn: Can I ask a little bit about your trip to Korea, when you trained? How long were you there? Vic Martinov: I was there for three weeks. Sandra Schermerhorn: Three weeks. And when you trained were you just in Seoul or did you go to any other areas? Vic Martinov: Oh I did go to Seoul yes, that’s right, yes. We trained in Seoul most of the time, twice a day, like I said. And then we took some trips. We went to Osan Air Base, and in Osan there was- they had a school in the town and one on the base, and we trained in both of those schools. And then we did take trips out of the country and around- segued around a little bit; but mostly it was in Seoul. Sandra Schermerhorn: And when you trained at the schools did other teachers train you or was it our founder who trained you? Vic Martinov: Oh no, no it was other teachers; yes, there were other teachers. Sandra Schermerhorn: Oh, so you got to meet a lot of people while you were there. Vic Martinov: Yes, it was interesting. Yes, there were other people. But one thing that I always think back on now is at the headquarters in Seoul, several of our training sessions, it was our founder personally that worked with us. And it didn’t occur to me then but I realize now that- how the members must’ve felt, for somebody coming in and they’d get– and especially we were just people trying to train, that’s all. And to get the treatment, the special treatment they gave us, it was really great. Sandra Schermerhorn: And what rank were you then? Vic Martinov: I think– oh, let’s see, I was– Sam Dan, I think I was Sam Dan. I was Sam Dan, yes. Sandra Schermerhorn: When you had your Cho Dan test, was it like we do now? Was it like a several hours test where you do forms and sparring and all different things? Or what was it like? Vic Martinov: I’ll tell you what it was like. The test was conducted by Jong Lee; Lee, from San Diego, was the developer of Tangsoology and taught it in one of the colleges there; and more I think it was in San Diego. His name was Jong Lee, and he was one of the guys who came out and claimed to be the western representative of whatever. But he organized the testing for us. And at that testing I think there was nine candidates, and one of them was Mariano Estioko, who was testing for 2nd Dan I think. And there was- Chuck Norris was testing for 2nd or 3rd, I’m not sure right now. And then there was Jerry Taylor Junior and Dennis– oh not Dennis then– but myself and there was– I have the list but I can’t give you the names of those people– and I have a nice photograph of the whole group, for the Cho Dan test. Yes, I have a photograph of that day. Sandra Schermerhorn: That would be– if this project, we get to the point where we use photographs, is that something you think we could get a copy of? Sandra Schermerhorn: Oh that would be nice. Now I know the name Estioko but I’m not sure why. Vic Martinov: His number is something like 400-and-something. And he was a low number, high ranking. Anyway, he came down from Sacramento. But Andy Ah Po was in that group too. Sandra Schermerhorn: That’s probably why I know his name. 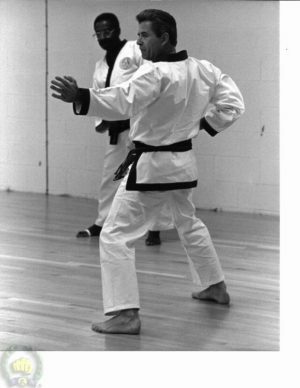 Vic Martinov: And he was Andy Ah Po’s instructor. Sandra Schermerhorn: I see. So, that was your Cho Dan test? Sandra Schermerhorn: How about your E Dan test, where was that? Vic Martinov: That was in South Bay area also, and that was conducted by our testing board. We had a testing board of five. Let’s see, I’d have to look at the date on that test, but my Cho Dan was 1966. So, that would have to have been ’68 probably- yes, maybe ’68, I think, yes. Sandra Schermerhorn: Is there anything memorable about your Cho Dan or E Dan or Sam Dan test that kind of sticks out in your mind? Vic Martinov: Oh yes, Lee; Lee was interesting. He tested us, and to answer your question, it was pretty much the same. You’d get up and do your forms. And when we used to conduct tests you did all the forms; you didn’t do just a couple of forms you did all the forms. But anyway, Lee had us do the forms. And then on breaking we had to do a- everybody had to do a jumping round kick, and the holder of the boards was standing on a chair and you had to walk under the boards, two boards, standing–. Sandra Schermerhorn: The bottom of the board had to come to the top of your head. Vic Martinov: Yes, you had to walk under it. So, the person’s standing on a chair and he’s holding the boards, and then you’d walk up, see if you could get your head under it. That was one–. And then he did- he brought a big box of rocks and an anvil , where you put it, angled it out and handed it to us. And none of us had done any of that type of breaking before. So, he had this big box of rocks and he– I’m thinking to myself how do you squeeze a rock? How do you pick the best rock? So anyway, two of us broke that rock. Sandra Schermerhorn: I don’t understand how you broke it. Vic Martinov: Well what you do is– you have this anvil, it’s a piece of heavy steel, and you put the rock in your hand and you lay your hand on the anvil, like that. Or you put the rock flat and put your hand on it. So, you put it this way. And then you–like that. Vic Martinov: But there’s a secret to it. Sandra Schermerhorn: What is that? Can you tell us that sir? Vic Martinov: So long as we’re not being taped. Sandra Schermerhorn: I can turn it off. 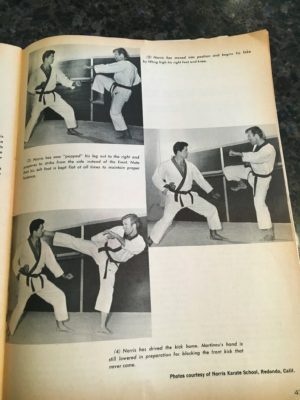 Vic Martinov: No, fortunately for me I had read a book written by a Korean martial artist, Oyama, who taught Japanese style, Mas Oyama, Okinawan style. Mas Oyama has got a book and he’s got a section on breaking, that breaks everything from bricks to locks to beer bottles to anything, boards, whatever. And so, it’s a matter of picking the tip of the rock up so that when you strike the rock it moves down a little bit and gives you just a little inertia, gives you a little inertia. I mean that isn’t going to help you a lot but it’s better than trying to put it flat; it’s not going to work like that. Sandra Schermerhorn: So that’s why you held it. Vic Martinov: So I held it. Vic Martinov: Or, in my case, I put my hand on top of it and I squeezed the rock so that it came up- it raised up off of the anvil, and then when I took my hand up to strike I raised the tip, like that. Sandra Schermerhorn: I see. It broke. Vic Martinov: And so the funny thing is that of all the years, I had a reunion with Jerry Taylor Junior who tested with me, he was second, the only other one that’s broke the rock. And all these years I didn’t know that he knew the trick. And he didn’t know that I did. So, I’ve been thinking, boy, he really did some marvelous, miraculous thing. And just last week, on the 29th of July, at my home, we had a gathering as kind of a celebration. Sandra Schermerhorn: Oh your celebration party, yes sir. Vic Martinov: That celebration. He was there, and he told me, he says, “You know,”–because I was saying, “Your nature Jerry is that you’re always calculating everything.” And I said, “I go around, I just do what I’m told, and you’ve got it all wired,” because we used to spar in the tournaments a lot and he was always checking out who the next guy is going to fight and he’d make sure that I got the one he didn’t want to fight and stuff like that, because he always figured things out. And so, I was reminding him of that. And he says, “Yeah, another thing I never told you,” he says, “that Lee, Jong Lee, that tested us, he gave me some lessons on breaking.” I said, “What?” I said, “I don’t believe it. So, he told you how to make the break.” And I said, “And I fortunately read Mas Oyama’s book and came there with a little bit of knowledge.” We didn’t know- I didn’t know; he knew we were going to break but to me walk in there, there’s a box of rocks and I’m trying to squeeze them. So anyway, that was kind of a funny thing, that two of us had an idea that there was some physical principles involved here, not just magic. That was that. And it was a long, comprehensive test. But nobody, I don’t think, gave tests any harder, that I’ve ever seen, than well the tests that we used to do; not that we tried to fail people but that they were just comprehensive. They did all the forms, they did all the one-steps. We did three-steps, we did jump kicks. We did the basics, hand techniques, feet techniques, combination techniques. We did attacking techniques and we did sparring and we did two-on-one sparring. We did it all. And then just as necessity, with the sheer volume of people that you have, you had to streamline the operation and come down. I will tell you the excellence is better now than ever, ever before. Sandra Schermerhorn: Is that, right? Vic Martinov: Yes, there’s no doubt, no doubt about it. And kids are doing things that I could never dream of, the techniques, which is the way it needs to be. It’s the beautiful way of growth. So anyway, we had the meeting in 1974 in Burlington and then we had the Charter Convention. And then we went through the agonizing ordeal of hammering out the charter and bylaws. That was torture, to see what Board of Directors meetings are like, in those days when everybody’s looking at every word and analyzing every word and what it means and going over it. And then a red line, highlighting it and getting it changed. Sandra Schermerhorn: How many people were at the meetings? Vic Martinov: Oh the meetings. Well one of the geniuses of our organizational structure is the balance between elected and appointed directors. And I would say that, however it happened, it feels right and it has worked and it’s been working and it feels right, and I think that it was good fortune that we arrived at that balance, which is 2 to 1. And we started out, it was a total of 30 directors. There were 20 elected and 10 were appointed. And, of the appointed directors, I was one of the first; I was one of the 10. And so, I started in as a director in the organization, when the organization was founded. And I stayed with that, two of us. And then there was a gentleman named Charles DiPierro. Vic Martinov: DiPierro, yes, Charles DiPierro, and he was actually elected the first Chairman, and I was the Vice-Chairman. And he had a real problem with the five- the one-third appointed directors. He had some– I didn’t know him real well but what I knew of him was I– my senses told me that he was a very honorable man and that he had very definite ethics, and so much so that he was constrained from participating in an organization that was not 100% democratic, elected, because of this idea that somebody would be appointing a certain amount of votes just–. And he talked to me about this and he told me he was turning it over to me and- because he was going to withdraw from that spot. And he did withdraw. And we went along with the two-thirds, one-third appointed; because he was not long in the martial arts, Charles DiPierro. And I’d have to check on this but I think maybe he may have been a green belt or something like that; or maybe red belt, I’m not sure. But he didn’t really have the same orientation, I don’t believe, of the Moo Do part of our whole structure, of our whole structure necessarily includes business and art. And so, I personally feel that the balance was a stroke of genius. I mean it seems like it’s the right thing. So, we went along with 30 for a number of years. And then it was expensive to transport people around and, of course, we did everything in person. And so, it was changed and our charter was changed to- from 20 and 10 to 10 and 5 so total 15, which is what we have today. Sandra Schermerhorn: When you were working on the charter, sir, what was the rationale behind picking that? Do you recall how that came to be? Vic Martinov: Well, it had to do with the fact that since it was a Moo Do organization there were certain things that had to be left to the founder on the art- had to be left to the art part of the art. You couldn’t tamper with that. You know, so you couldn’t change history or tradition there, philosophy or standardization or certification requirements, things like that. So, somebody had to– by that concept then that Moo Do should have reach a little bit into the Board, into the business matters too. So, I would say that there’s no real rationale other than it was arbitrary but it was a delicate balance that had to be met because you couldn’t have it all business to run the art. It doesn’t work. And we know that all the arts fall apart. They have all tried it and they all go out and they get into business and they’re self-proclaimed artists and they’re mixed in, there’s no structure all in together and everybody goes off and does their own thing. And this I’m talking about other martial arts all over the world. But when we started this organization– I told you earlier that I consider myself a practical person and I like to get more for my time and therefore I went into martial arts in the first place because it was more for my development for the expenditure with time. Same thing here. I asked myself this question, “Am I going to stay here, be a part of this giant organization and dedicate a lot of time and my life to this, for what?” I mean what- under what conditions would I do that? And keep in mind up to this time I had wanted to get involved in monitoring the art and the legitimacy of the many students that we were connected with. That was kind of my giving back for what I was receiving from it. Now, we’re facing a larger matter here and why would I- I had an organization here, a karate Tang Soo Do association. I may not- I really- as I said, I’m happy here too, you know, But, now we’re going to all come together in Burlington and a lot of people from all over the country are saying, okay, we’ll consider forming a federation organized in the States and that’s what the founder want- wished to have. And he was there to do it. And I was sitting there, asking myself, under what conditions would I give my life to this thing? And there were two things that mattered to me. 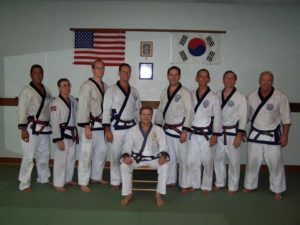 One was that it would be the only way that any person in the United States could receive the certification from the Korean Soo Bahk Do Association, would have to be a member of this federation. So, nobody else could be in this country and communicate directly with Korea and get numbers in this historic lineage. That’s number one. Number two, is that I wanted a higher good, a higher place for my students to look to other than me so that I don’t have the responsibility, for one thing, and secondly, I’m not going to be around forever and so to find- to be able to connect with a legitimate, historic, traditional martial art that’s founded by a person who is of the highest ethics. If that could be accomplished, then I would be happy with that. And that’s the way I feel it’s gone exactly. I mean in the charter it says there’s no other organization in this country and that’s in the charter, you can rely on that. And I lived through that with the times that other Moo Duk Kwan Tae Kwon Do practitioners are trying to do- come to Kwan Jang Nim our founder when he was alive and say, come to our tradition, we’re going to make life wonderful for you and we- you know, we’re really your-we’re worthy, the real roots of yours and but he never- you know, he never, ever had a hidden agenda, it was always on the table and he let everybody know it. This was an American organization for Americans he said. And that was the promise he made and that’s in writing and that’s what we have today. Secondly, from knowing him, at the time that I knew him, really reconfirmed to me that he was a pure and just person. And as I said, I mean I never, never seen any agendas from him other than just his conscience and his words really were committed to us. And he was always did. So, like I said, to me and- this organization what’s most important in this organization, most important, is that it has endurance that it can go on, that it doesn’t fall apart because none of us would want to feel that we’re inherit- contributing and being a part of it and then someday it splinters off and goes the way of a lot of them. And I think that’s why our charter and by-laws are so good because they’re like a constitution of the United States. You know, they’re so complicated you can’t change them if you want to sometimes and, you know, that’s the danger of expedience trying to change your governing documents so that you can do things easily and then you destroy yourself. So, I think my conclusion, that when get to this point, is that we have the right talents, and we have the documents and we have good people. And that’s to me like I can go in peace. Sandra Schermerhorn: Well, a lot of hard work went into it and a lot of thought. Not just hard work but a lot of mental thought. How long did it take to get the charter in place? Vic Martinov: I could- you know, I could find those dates in my records but I will say at least a couple of years. Sandra Schermerhorn: Couple of years. And it was people from all different parts of the United States working on it. Vic Martinov: It was the board of directors that were working on it. And as I say there were 30 of them. Vic Martinov: Yes, and we had some marathon sessions until your brain feels like it’s been squeezed, you know. And our founder was present at every one of them. 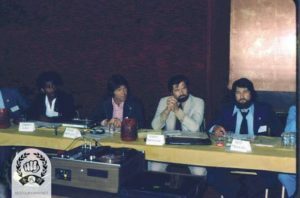 Vic Martinov: Every meeting he was there. And sometimes it would look like he was far away and when- and you’d figure that he wasn’t understanding what was going on but he’d have to step back a few- that often to go an area that he realized was, you know, way off base. He’d snap to it right away and become a part of it. He knew what was going on. Sandra Schermerhorn: So, he was there, he would step in and give directions sometimes but mostly he left it up to you? Vic Martinov: Absolutely. Most- almost entirely left up to us. He- but he was there and he was aware of what was going on and he was consulted with things that- particularly things that pertained to him like section 4 of the charter, giving the veto to the president, Kwan Jang Nim Hwang Kee. Sandra Schermerhorn: When the charter was done did he tell you anything? I mean did he say if he liked it, or it was acceptable? Vic Martinov: No, I don’t think that was the kind of discussion that would have happened or that I recall happening. It was a question of we needed the documents; we needed the documents to get behind us so that we could go on with the business of- that we were all there for and that was training, into the training. And to talk about all the Moo Do aspects of the art and talk about clinics and different functions that we were going to have. And getting excited about maybe some kinds of scholarships and things like that, you know, that would be a joy, instead we’re stuck with this administration. You know wringing out charter and by-law documents it was just- it was more- that’s something we had to get past. And beside the charter and by-laws were the articles of incorporation. They were filed. And then there was the whole business of just when you think you’re about done, what are we going to do about trademarks and all this. And then we got to talk to the lawyers and accountants and what about the bookkeeping. And what about an administrator to- can we afford to pay for an administrator? I mean, we can’t do it voluntarily because nobody will do anything, you know. Or one poor devil will end up doing everything, you know, until he drops and then we’ll find somebody else. So, we had to make those decisions but in making it was a lot of discussion. It was tough. But, anyway, it was to get past it, to get past it, lay the foundation so we can go on. And not to get past it so fast that you don’t have a proper foundation either. So, that was- and everybody understood that, that’s why we beat it to death because they were- it was– and I would say- you know, I’m tell you my history, what I was thinking, and I would say everybody- every one of those 30 people were thinking the same thing, how it- you know, their time’s probably just as important as my time. And so, they were there and boy, it was tough. It really was a meeting that you want to do once. 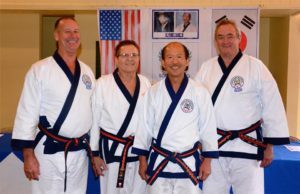 Sandra Schermerhorn: Sir, looking back, what was your best time in Moo Duk Kwan? Vic Martinov: I suppose my best time really was- my best time had to be with friendships and people and… One of the things that I think about that makes me very happy was meeting the founder and the occasions that I had to do that in ’72 when we- and then Korea, yes ’72 and then ’73 and just getting to know him over the years. I think it’s just like the philosophy book that he has written that hasn’t been transcribed completely yet but for me when I look through that and read it it’s like a conversation with him. And it’s just- it’s a nice feeling. It’s like having your friend back again, you know. And so, that’s a nice feeling to have but when it comes to friendships and the connection with human beings, I have been blessed in that regard. I mean I’m so blessed and I think the best time I don’t know how I can- how I could single out a best time. It kind of was one long connection with friends. Sandra Schermerhorn: And did you have a worst time? Sandra Schermerhorn: But there were some difficult times. Vic Martinov: There were a lot of difficult times and still a lot of difficult times but the- in the art and the training taught me more than it ever hurt me. So, I would say that it- my times- my rough times in my life that I absolutely got more help and assistance from the art rather than a bad time in the art. A bad time in the art for me is like a broken bone and I can’t do what I’d like to do right now. But I’m staying there so I’m- I haven’t had any bad times. Sandra Schermerhorn: Do you have a photograph that you remember or that you have that had special meaning for you? Vic Martinov: That photograph that I was talking to you about has special meaning to me. The day that we tested for our Cho Dan, that was special. Sandra Schermerhorn: And do you have any treasured items from training? Vic Martinov: I have a lot of items and I wouldn’t- I don’t know, I can’t think of anything right now. That’s a more- that has more significance to me, I can’t think of anything right now. Sandra Schermerhorn: Ko Dan Ja testing? Where was your first Ko Dan Ja test? Sandra Schermerhorn: Was your test the first one? Vic Martinov: No, the first one was not- it wasn’t- my first one was not a week’s long test. Then the tradition started in- at a time after that so then for fifth, sixth, seventh, Dan examinations were all in the new tradition of the week long (test). Sandra Schermerhorn: What was your Sa Dan test like? Vic Martinov: It was a test in front of the Kwan Jang Nim. It was the full test. Sandra Schermerhorn: So, it was more like the Sam Dan test? Vic Martinov: It was like a one-day event. It wasn’t for a week. Sandra Schermerhorn: Do you recall who tested with you? Vic Martinov: Yes, that was- yes, I had a full test in class that time [ph?]. Sandra Schermerhorn: Do you have any special memories from any of them? Vic Martinov: Well, I do from all of them actually. It was- it’s the same- it’s the connection with everybody and it’s– well, I started getting to a level that it was more of helping conduct the test than it was being tested. And, of course, at all of those our founder was present during the last- the final day of the test. And one of the things that I remember– I mean I was testing at a high level. Sixth through seventh Dan at that time was the very, very high level and, in fact, they only say in the Korean culture that the number seven is- has a special- it’s a special number. It’s as high as you can go. Our ranking used to go to 7 and that was to reach the- that place. And then the organization grew and that’s how- swelling at the bottom that it had to move the leadership up and so to accommodate that it’s a natural way, it’s the way of growing without saying I’m going to have so many ranks and then we’ll someday fill them up, it’s that you develop the foundation that grows and swells and you have to accommodate it and in the normal- in the right way. And so, I was testing and our founder, Hwang Kee, he calls- it was like he was interviewing but when he called me up it wasn’t an interview, it was like- almost like a discussion- like he was talking to me. But, it was not a discussion, it was a one-sided discussion, for he was talking to me. And he told me that he felt that I needed to be more spiritual and less physical and I thought that what he was saying was I was getting old. And as usual I took that information with me and I thought about it for a long time until I realized that what he was really saying was that material things and spiritual things are mutually exclusive. You can’t have access to spiritual power if you’re chasing material things or if you’re bound to focuses on material things. You have to be in balance, you have release. You have to release from something. So, that would be to say if you’re too physical, and I prided myself of being physical. I can tell you that I loved to jump and twist and wrench and- because that’s the way I was brought up in this art, it was hard work. The training work for me. So, he was saying that really and truly you have to learn to release, you have to learn to go with the flow, to submit and allow yourself to be open to the powers that are available to everybody if you can tap into it. And that was his message for me. And it was a good message that I didn’t understand at the time but I grew to understand. That was a very memorable time for me. And then having the opportunity to demonstrate for him. He always asked if there’s- well, he always asked the higher-ranking candidates if there’s anything that you’d like to demonstrate, that you’d like to demonstrate to do it. And having those opportunities on several occasions I took advantage of that and even thought about it even if I knew he would be asking me, I thought about what I would really like to be able to show him that I’m doing, you know. And it was beautiful. You know, that’s a nice- that was a great opportunity. Sandra Schermerhorn: What was your favorite area of training? What did you like best? Vic Martinov: You know, all the areas of our training have kind of value and a troop [ph.?] will specialize in things- in some areas, one area or another. I like sparring. I liked sparring techniques: attacking, the sort of initial moves. And what I really like the most of all now is to try to develop an area that makes our Soo Bahk Do effective. Effectiveness in technique that’s what I call it. And you can say it in many ways but I developed my own language in which to kind of understand it. And it has to do with mobility, direction, penetration, and power: how do you make your techniques effective? And mobility has to do with footwork. You have to be able to move about, not just linearly but circular, circular movements. And direction has to do with where your center of mass is outside of the base. So, if you have a base and your center of mass is outside of that base, it’s going to- you’re going to topple over in that direction. And so, what I call it is dynamic equilibrium. It’s instead of being at equilibrium at rest, your equilibrium in motion, in moving. It’s moving balance is what it’s called. And that’s direction. And so even if you’re moving backwards, if your body’s moving backwards, as long as your center of mass is outside of the base in a forward direction, your direction’s forward so that you can retreat and still have complete power going forward. So, if somebody’s chasing you, backing you up, they’re not backing you up, they’re coming into your __________ [ph?] and so that’s direction. And penetration has to do with adjusting — always adjusting. You need to adjust all the time because if you’re not adjusting– and this is something that I see a lot of practitioners, young practitioners still do that, they’ll step forward with their front leg and leave their back leg nailed to the ground, you know. They leave you strung out. Instead of just moving naturally and allowing your body to adjust continually so that when you need to be effective, when you’re finally in a position to have an opening then you can make it work because you’re not out of range. You can’t lean and break your posture and do everything and be effective, it won’t work. So, you’re constantly resisting. And then power, this is simply twisting the waist and shifting the mass. That’s all you need to know. When you twist your waist and then shifting your mass and that will develop the power, explosive power that’s in you. And that’s my area of interest. This is what interests me. And then the fifth one that I’ve added to that is you make your opponent do what you want them to do. So, and that would be like fakes. You get your opponent to get in a position that you want him to be in and then everything else now, mobility forward, direction, penetration and power. And so, that’s kind of what I like to do. The other thing I like to do is I like to understand that those are physical principles and coupled with physical principles those are the principles, concepts, there are certain truths that we have to understand and one of them is that energy flows through us continuously just like it says in the Sip Sam Seh. It flows through all of us continuously. It doesn’t come from us, it comes through us. It doesn’t wander, it belongs to the universe. But we have to not restrict that flow. And that comes back to this point-release- that the founder talked to me about be a bit more spiritual, you have to learn to release, you have to learn to accept. You- and if you do that then you can move with slow energy like moving with the waves in the ocean, you surf with, not against it. Drive the freeways at the right time, you know. Don’t get on there in rush hour, you know. This is what this is all about. And so, if you couple those physical principles with these truths of energy flows through us and we release and we don’t restrict it, that altogether makes effectiveness in the way that we live and the way that we apply our techniques. That’s what important to me. That’s- in a nutshell pretty much that’s what my training has taken me to. You know, in a physical standpoint. Sandra Schermerhorn: And that’s what you like to teach too? Vic Martinov: Yes. And I like to teach Ho Sin Sul. Ho sin sul are self-defense techniques. I like to teach that too. So, I would say there’s a lot of things I like to teach. I like to teach and I used to concentrate very, very heavily on power kicks, power kicks. 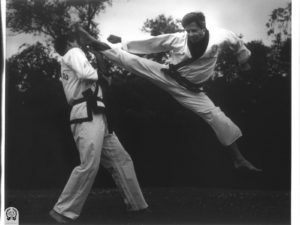 Almost entire training sessions from- for long periods of time would be power kicks. Stretching power kicks. That’s why I feel that I- for me I’ve come up with these concepts of direction and penetration and power is because I worked on power kicks before. Fronts, round, side, heels, you know. So, that’s from years of doing that. This is these truths that come, at least my truths. Sandra Schermerhorn: Going to change topics here a little bit. Kwan Jang Nim H.C. Hwang, when did you first meet him? Vic Martinov: I met him in Burlington in 1974 for the first time, but I had written to him. I had written to him from 1968 on continuously and I think I have some letters from him when he was in Greece. Sandra Schermerhorn: Just before he came here? Sandra Schermerhorn: Do you have any favorite stories about him and your training with him? Vic Martinov: I do but I wouldn’t- I don’t think that liberty to share. I will say that we have had- we have- my thing with our current Kwan Jang Nim is I feel such a closeness and a genuine friendship. I mean a genuine friendship. And I believe that he feels that way too and it’s- it says a nice thing and he has- we have been together and trained together just the two of us. We have done a number of things just together the two of us. And so, all I can say for you- to you is- and to me is that he’s a very dear friend and I have a very loyal respect for him from me. And my feeling is that his father- his father’s dreams and his vision and his suffering that he endured and the tremendous patience that he had, as I said, coming to this country and finding guys that thought punching and kicking was what it was about and he was trying to teach world peace and there was a large gap there between that and he never once told us that he took us a long way. But his son, our current Kwan Jang Nim, made his dreams a reality. His son was the one that implemented the dreams. His son is the one that did all of the hard lifting for the curriculum and to make this into an institution of learning. And so, I think that in my view of things, that we as federation and as an art, we’re so blessed because I- and I don’t believe in the right of a divine right. I don’t believe in divine right or inheriting positions. But in this case- and follow- we follow the procedure in the charter too in having the successor named and the whole process. But, besides that he- our Kwan Jang Nim was absolutely the right person to follow his father. I mean right from every sense of the word right because he dedicated his life to it, he implemented those dreams. <break in tape> Time Stamp? Sandra Schermerhorn: You were talking about Kwan Jang Nim H.C. Hwang, about inheriting, but being the right person. Vic Martinov: He was the right person. I mean and that to me I always feel is a blessing for our organization because here we have a vision and a dream and here we had an implementation of a vision and dream and a strengthening of our foundation with the that endures… From this point on it’s like a university. We have a board of trustees. Anybody can- legitimate person or group could continue on that institution. But we definitely would be nowhere without the founder and we wouldn’t have an art in my opinion without the son. So, we’re lucky. So, I was a member of the board of directors. And then I came to a place where I really felt- and I have a letter that of resignation that I hand carried to our founder, Kwan Jang Nim, in New Jersey and I spent some time with our current Kwan Jang Nim discussing that and he presented it to his father. And then from there the- they contrived the fulfillment of the Technical Advisory Committee which created a slot that again they- that I could be appointed to. Sandra Schermerhorn: How long were you on the board? Vic Martinov: I’ll have to check those dates but it seems forever. (laughter from both) And so, I thought I was going to move on. Then they- so we had- our documents did provide for a Technical Advisory Committee although there had never been a committee. It always had only been the chair. I’m sure a chairperson- H.C. Hwang was the chairman of the Technical Advisory Committee. And so, they expanded that to a real committee and then somehow, I was appointed to the Technical Advisory Committee. And then that went along with the duties responsibilities of the TAC which were also- and we had- at one meeting, I don’t remember the date, but it happened to be held at my home and we had- I remember, we had the big round table and all the TAC members were there and we talked about all the issues, the latest issues and I brought up this issue that I felt that I really was leaving the TAC and it wasn’t the case of what I wanted to do, it was that my life had already gone in that direction. It’s like- it just was a natural thing. And so, they came up with the SAC. There’s no place to run. Sandra Schermerhorn: There’s no place to run, they keep giving you something else to do. Vic Martinov: It was great. It was great. And I’ll tell you, it was the most beautiful thing in my life to be a member of the SAC because a member of the SAC was- served at the pleasure of the founder of the art and was a- for the express use of the founder to consult, be available to consult with the founder, and that’s it. There is nothing else. There’s nothing else. It’s just to- and to be, you know, available as you are available to the functions and support where we can and all that. But it was mostly– and if we looked at the description of the SAC it is at the pleasure of the founder and to serve to consult with the founder. And so now I came after all these years to a place– oh, and I will tell you that probably one of the most significant things to me, one of the most significant things that I’ll never ever forget, was when- this was in the presence of the founder of our art and I- we had all the standardized techniques and all this curriculum and all this stuff that we were- and I was teaching clinics that were getting off into mobility, direction, penetration, and power and different flow of energy and Neh Gung exercises and things and I said I need to discuss this with the founder, with an interpreter and the other members of the TAC were present, and I said, “I am teaching things that are not exactly the…” And before I could even finish saying what I was saying he said, “Whatever you teach is Soo Bahk Do.” And it just set me free. It was so beautiful. That to me was one of the most profound memories I have. And also, gives you a little sense of where his spirit was. He was a real, real person. So anyway, from the SAC, I’m still there. I’m trying to figure out another organization we could develop for me to move into. Sandra Schermerhorn: I think if you don’t decide on one that somebody else will be able to find you one. Vic Martinov: No, I’m very, very happy to be where I am and I’m very, very happy to be where I am and for- where I am to be what it is. I couldn’t ask for anything more in the organization as comfortable. That’s the truth of the whole thing is that this- that comfortable is the right word. And everybody, ever person here seems to be comfortable. I mean that’s obviously to me more significant, more important than any other thing. It’s good. So, what else? Sandra Schermerhorn: What do you think the most important thing is that a senior can contribute to juniors? Vic Martinov: We’re all trying to develop the individual. I mean the starting point has to be within the individual: self-development. In order for any person to be of any value to anybody else, to their family or society or the world, they have to deal with themselves first. And I think that it’s always an example that a teacher has to set for his students. And which reminds me incidentally of the- my definition of an instructor and a teacher. An instructor is someone who shows you what he’s been taught. A teacher teaches things that he has no way of knowing and he’s never been taught because if- because what happens that teacher develops insight and learns to believe in his insight. It’s like you were talking about don’t resist, accept it. And when you have the proper foundation and it connects with what our founder said to me: whatever you teach is Soo Bahk Do. See he knew that. That if you’re a teacher then there’s something inside of you that you can let and not question but let it come out. Not that you’re making things up as you go but that you are- and this is what you give to your students. I’ll give you an example that was interesting. I have John Ferguson who trains with me and he comes on Tuesday and Thursday and so we have sauna after the training. And when he first started with me he said- so I went in and the bucket wasn’t full of water and I went and I got some water, he said, “Well I guess if I was a good student that bucket- I would have filled the bucket.” I said, “No, if you’re a good student you’d recognize- you’d likely be aware that the bucket needs filling.” He says, “Well, that bucket is never going to be empty again.” And I said, “That’s not a duty, it’s an opportunity.” And that was all that was said. And so, this is what I’m getting at is what’s the best thing the instructor can give their students is to share with them and to try and develop our philosophy in trying to get that person to understand themselves and to want to learn and develop the awareness that we teach. To set an example I guess is- but can’t do it first, you can’t order somebody to do what you think they should do, got to come from within yourself, the same as you hope they’ll get that lesson like I’m not going to sit in this chair, it doesn’t belong to me. Sandra Schermerhorn: Practitioners today, students today, what would you like them to know about you or how would you like them to remember you? Vic Martinov: Well I’m serious. I take things seriously and I cherish friendships. And, you know, I know that I have a reputation for maybe being hard to know. People that- I know this because I’ve been told it a lot of times but once– because see I have a philosophy, when you come into train if you have any questions, don’t ask them. I don’t want to hear them, nobody in here wants to hear them, we’re here to train, don’t take up so much time. When you’re here for three or four years you can ask all the questions you want. That’s my philosophy. And I’m going to train with you and we’re going to go through this thing together and that’s what I believe. So, what I want them to know about me is that from whatever I’ve done or whoever I am my opinion it’s been honest. Sandra Schermerhorn: Thank you. Is there anything else you’d like to say? Vic Martinov: Yes, a lot but, you know, I don’t– I can’t think of it right now. I have a feeling that you want to see a manuscript and it’ll kind of jump <inaudible>. Sandra Schermerhorn: Okay. All right, well thank you very much. 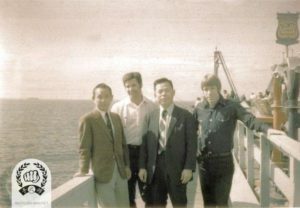 Vic Martinov with his senior students and Kwan Jang Nim H.C. Hwang year ???? 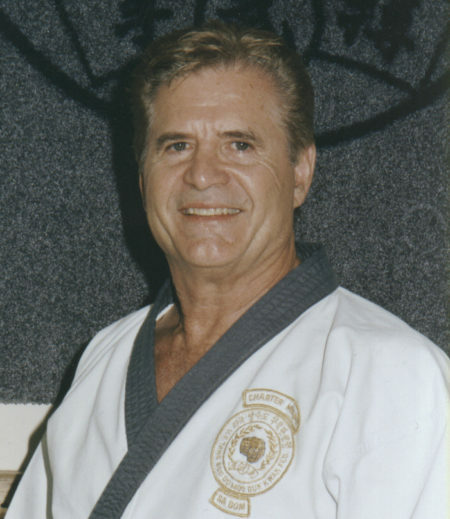 Victor Martinov Sa Bom Nim passed away in 2015 and there are several memorials from his senior students from South Bay Moo Duk Kwan, click on this link to read this special tribute. completed the edit review, added some transcript terms, added photos pertaining to the time line in the transcript. There are only a few inaudible words or phases. A few things I’d like to discuss further concerning this project: we should allow the interviewees to edit their own transcripts as much as possible, and if they want to edit any information they can. I will need the MP3 files if we are to edit any of audio interviews, if needed. So please send them to me. I’ll see if I can edit the audio. Seiberlich SBN may this point…”If the intent is to portray various individual’s accounts of their history as an informative insight into the history of the MDK, then each history deserves editing. If they are to be presented as merely idiosyncratic tales spun by some of the older folks in the Organization, then it may not matter.” While I agree, it would be very difficult to use the audio recording if changes want to be made. Perhaps adding the photos to the proper timeline we can add additional information as needed to support current activity.